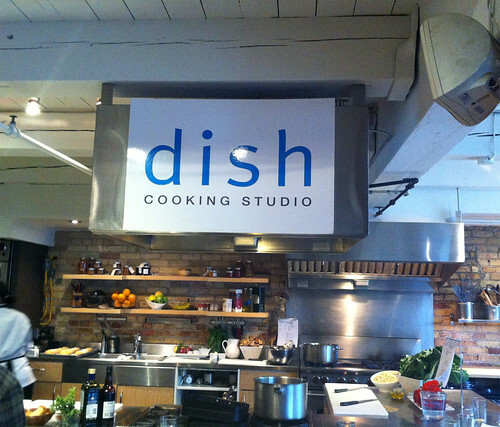 About two weeks ago, I went to check out the Dish Cooking Studio with my friend Suzanne. I happened across one of those group discounts in my email and sent it along to Suz, thinking it would be fun to spend a night cooking in the same kitchen. Before we knew it, we had signed up. Rather than a cooking school, Dish describes itself as “a culinary destination for people to connect and have fun together.” If you're looking to pick up some kitchen skills, you're probably better off at, say, George Brown. Not to say that Dish probably won't walk you through some of the basics. It's just that their aim isn't to make a chef out of you. It's to ensure that you have a good time cooking in the kitchen, meeting new people, and enjoying a great meal at the end of it all. We originally wanted to do the Mark Bittman class but couldn’t coordinate our schedules, so we ended up picking the “Lovely Jubbly: The Food of Jamie Oliver” class. Fitting since a) we’re both fans of Jamie and b) the menu had our mouths watering. I've actually driven by the studio a few times in the past (it's located on Dupont, just a few steps west of the Dupont subway station) but it never really caught my eye. It's not a very big place, but that's what lends to its charm. It's meant to cater to small, intimate groups to make the experience that much more special and manageable (as the saying goes, too many cooks in the kitchen...). Upon arrival, we were quickly greeted with a refreshing glass of rhubarb bellini along with some delicious munchies as we waited on the others to arrive: bread (from Jules as I was told), spiced nuts and some awesome warmed marinated olives. Once everyone arrived (the class is kept to intimate size of 8), we were given a quick introduction by our instructors and a run-down of the menu for that evening: a trio of crostini (aubergine and mint, pea and pecorino, tomato and olive), mushroom soup, Moorish-stuffed pork chops with butterbeans and chard, and vanilla panna cotta with roasted rhubarb for dessert. With four courses on the menu, it meant that we could all pair off and work on a course. Despite my love for panna cotta, I’ve never actually made it and so Suz and I decided to stick with the dessert course. The panna cotta was really easy to put together, and before we knew it, we were done and milled about the kitchen to see what everyone was up to. The place smelled amazing as all this was happening. Everyone was absolutely starving by the time we sat down to enjoy the fruits of our labour. 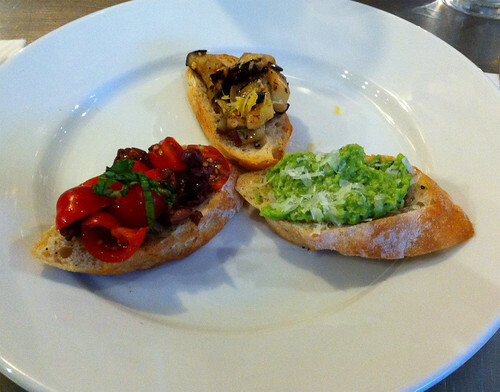 First was up was the trio of crostini. The plate looked stunning with all the different colours on it. Next came the soup, which smelled (and tasted) divine. 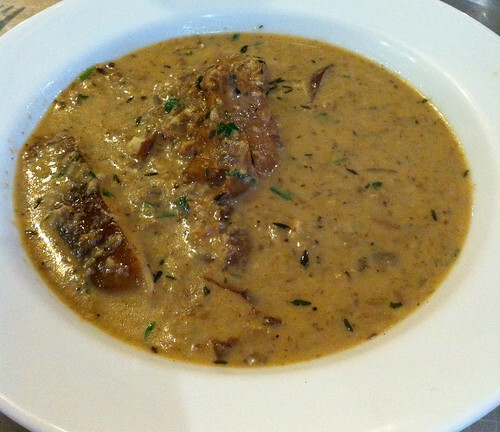 Half the soup mixture was left unblended so you get these nice chunky bits of mushrooms. 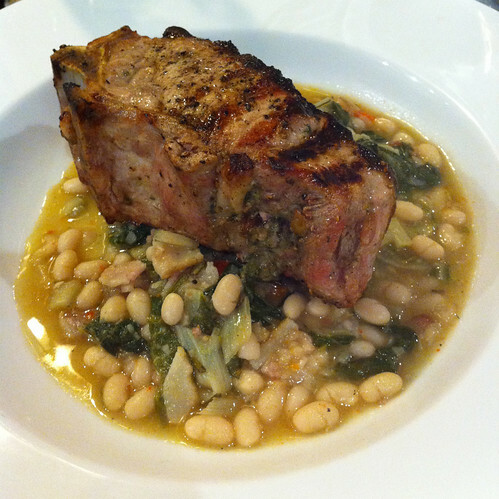 For the main course, we had the show-stopping Moorish-stuffed pork chops with butterbeans and chard. The chops were stuffed with some macerated raisins, oregan and sherry. It was a perfect pairing with the comforting beans and chard, which were loaded with bacon. Last came the dessert Suz and I made. While they didn’t serve the panna cotta that we actually made that evening, as they were still setting in the fridge, they did top the pre-made panna cotta with our roasted rhubarb compote. This panna cotta is a lighter than other versions I have, almost mousse-like, thanks to the whipped cream that's milk in. 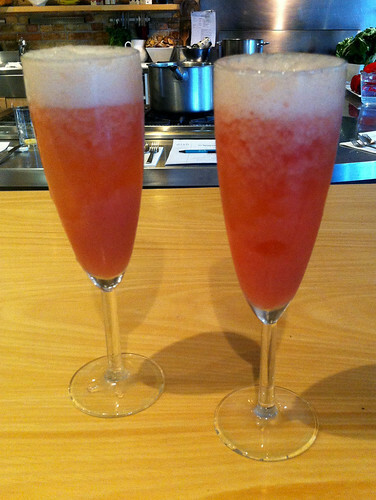 The rhubarb compote added a nice tartness to the dessert—a perfect palate cleaser to a somewhat heavier main course. It was certainly a fun experience, and we met some lovely people there that evening, 2 couples and a mother-son team. The staff were all very friendly, helpful and informative, letting us do our thing and only stepping in if we needed the help. I also like how Dish sources their ingredients and produce from as many local farmers and businesses as possible. Many of the vegetables were from nearby farms, and the chops (honestly some of the biggest I've seen in my life) were from Sanagan's in Kensington Market. It was refreshing to spend an evening in the kitchen with others who enjoy cooking just as much and have a love for food in general. Dish Cooking Studio runs a variety of hands-on cooking classes and workshops throughout the year and is definitely worth checking out for an alternative date night or girls' night out. The real mushroom soup recipe. The moorish pork chops recipe. 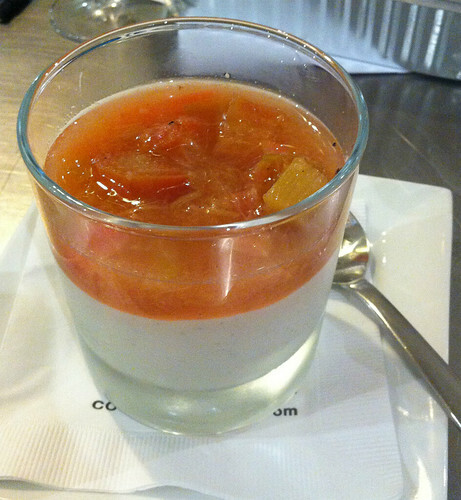 The vanilla panna cotta with roasted rhubarb recipe. Donna May 24, 2012 at 4:30 p.m.
Well-written article about my favorite cooking school. The first time I got to know about this perfect place was when my friend took me to one of their courses. 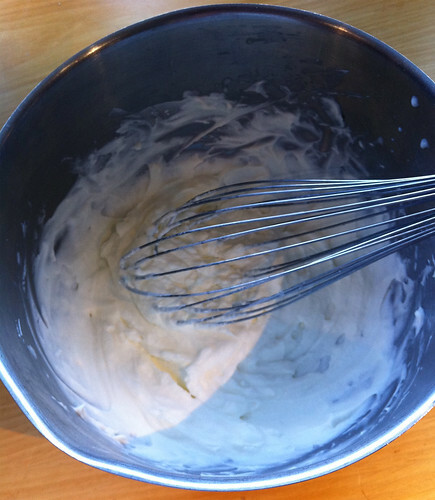 I still remember my first lesson there and also the recipe for springtime salad. I think the Dish belongs to the best cooking schools in Toronto. 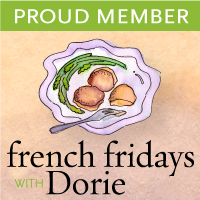 If you enjoy good food, it would be a shame not to check out this place.